Kresge has been helping homeowners just like you update and customize their bathrooms since 1983. 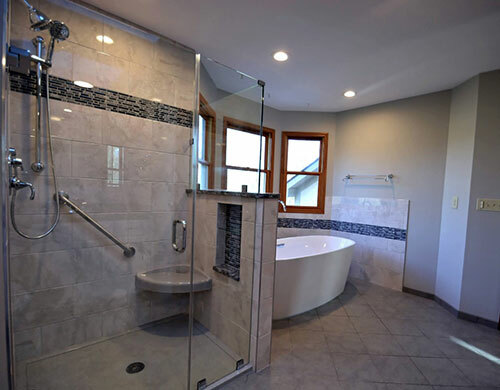 Whether you are looking to update a guest bath, design a family bathroom, or completely customize your master suite, Kresge has the expertise and professional team to bring your project to life. Our collaborative process combines your ideas and project goals with our extensive experience and creative solutions to maximize your bathroom’s potential. We simplify the process as much as possible to reduce stress, streamline the remodeling process, and keep your project on schedule and on budget. Planning & Design: Your bathroom remodel starts with a complimentary phone consultation where we get to know you and your goals for your bathroom. We then do a site evaluation to review and measure the space. Afterward, we proceed to the design phase, where we work with you to plan the look and feel of your new bathroom before any physical changes are made. Your design may include a 3D rendering to help you visualize your new bathroom and help ease the stress of the selection process. Product Selection: Complete specifications are prepared during the design phase. The product selection process is completed before any work is done to help you understand how all the elements will work together – and keep your project on budget! Our large showroom contains many samples that you can see, handle and even take home to see how they may fit and look in your own home before making final decisions. Production/Installation: Once your bathroom design and selections are just the way you want them, we will move to the construction phase. At this time, we will order your materials and assign your Project Manager who will oversee all aspects of your remodel. Your Project Manager will keep you updated on the status of your project, answer any questions or concerns you may have during construction, and manage all aspects of your project through completion! Follow up: After your project is completed, you will receive a “Client Satisfaction Questionnaire” asking you to rate our service, products used, subcontractors (if any) used, your experience with our staff, and provide any comments about your experience with us. Your feedback helps us address any concerns you may have not discussed with us previously and helps us continuously improve our level of service for all our clients. Your bathroom remodel is a great way to invest in your home – and your personal satisfaction of the spaces you use every day. Get started today! Contact us through the link at the top of the page to complete our Project Inquiry form and we will be in touch with you soon to answer your questions and schedule your complimentary phone consultation.